Chisel trim brushes, paint brushes, white bristle paint brushes, black bristle paint brushes, China bristle paint brushes, polyester paint brushes, fine finishing brushes, 5-in-1 tools, brush and roller cleaners, brush and roller spinners. The ends of these brushes are tapered to provide a better finish. Polyester fill brushes are grouped below the bristle fill brushes. 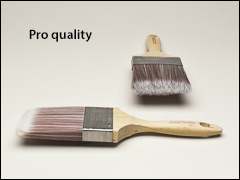 Other less expensive paint brushes are shown on the Square trim brushes page. Or for different styles of resin application brushes, see our Misc. brushes page. 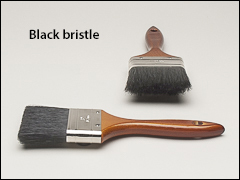 Blended black bristle brushes contain bristles of various lengths and stiffness to provide maximum performance. These are best used with oil-based paints, stains, and clear finishes. Beavertail handle has a hang-up hole and a steel ferrule. 1" and 2 1/2" widths are also available. Sold by the box, 12/box. Fine finishing brush. Flagged white China bristle, chisel edge, brass-plated steel ferrule. Soft enough for the finest varnishes, but resilient enough for the heaviest enamels, oil-based paints, stains, and urethanes. Solvent-resistant solid black plastic handle. Wooster #Z1120 Yachtsman. Made in USA. Sold by the box. 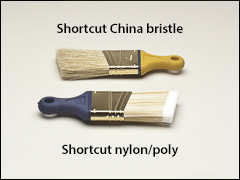 100% natural, pure white China bristle for finer finishes and for oil paints, enamels, varnishes and marine paints. Chisel trimmed. Stained beavertail handle with silver ferrule. 1" and 2 1/2" wide also available. Sold by the box. For latex, oil paints, or applying glues. Epoxy set, flagged ends, chisel trim. Plastic handle. 4" size has a beavertail handle. Sold by the box, 12/box. Mixture of solid round tapered filaments with tipped and flagged filaments to provide a smoother finish. Chisel trim. Works best with latex, acrylics and water-based stain. Molded soft grip beavertail handle. Sold by the box, 6/box. For smooth application of all paints. 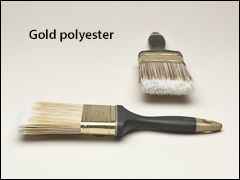 Brush is filled with solid round tapered polyester filaments that are blended, tipped and flagged. Epoxy set, stainless steel ferrules. Smooth sanded plain wood handle. Sold by the box, 12/box. Full-size brushes with maneuverable 2 1/4" handle. Soft handle material flexes for more control and comfort. 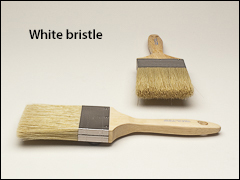 White China bristle fill for oil paints, varnishes, polyurethanes, and oil-based stains. The nylon/polyester fill is for all paints, especially latex or acrylics, and water-based stains. All are 1/2" thick. Sold by the box, 12/box. 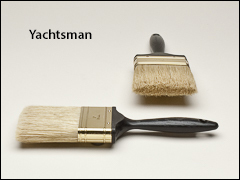 Clean paint brushes and roller covers , spread putty and open cracks for patching. E1119, E1169 and E1230 have steel blades. 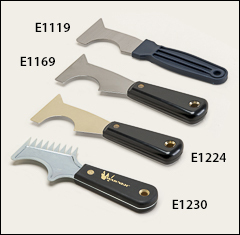 E1224 has solid, non-sparking brass blade that resists corrosion. All tools measure 2 1/2" wide. 10/box but sold in any quantity. Other putty knives and scrapers can be found on our Putty knives, scrapers page. WARNING: Proposition 65 Label for E1224 . Just what you need for taking care of brushes and rollers. Roller spinners increase service life of brushes and rollers. Keeps them performing like new. 4/box but sold in any quantity.